BZ Bank - Daily at the Round Table. Daily at the Round Table. The Management Board is responsible for the operational management of the Bank. 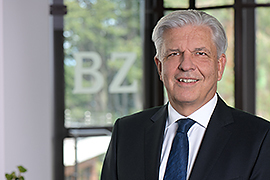 Rolf Schönauer joined BZ Bank on 1 September 2018. Since 1 December 2018, he holds the position of Chief Executive Officer of the Bank. Before joining the Bank, he was a Partner of various international business consulting and audit firms. He focused on advising and auditing banks and asset management companies in Zurich, New York and Singapore. Rolf Schönauer is a certified public accountant and completed the Advanced Management Program (AMP) at Harvard Business School. 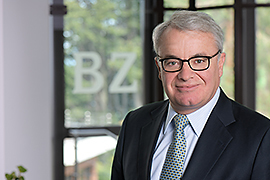 Dieter Göldi joined BZ Bank on 1 March 2006. As Chief Financial Officer, he is responsible for the Bank's back-office, risk management, IT and infrastructure. Before joining BZ Bank, he worked for more than 10 years in auditing at two international business consulting and audit firms, focusing on auditing banks, investment companies and insurance companies. Dieter Göldi is a lic. oec. HSG and a certified public accountant. 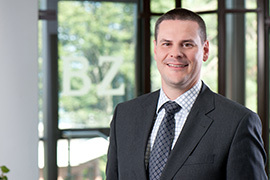 Marc Raggenbass joined BZ Bank on 1 October 2018. Since 1 December 2018, he holds the position of General Counsel and is responsible for all legal matters of the Bank. Previously, he was a Partner in an international law firm and advised Swiss and foreign clients on banking and financial market law. Marc Raggenbass studied law at the University of Berne, completed his bar exam (attorney-at-law) at the Cantonal Supreme Court of Berne and holds a Master of International Business Law (LL.M.) from the Europainstitut Zurich. He has published on various topics in national and international financial market law.